The mental health industry has come a long way in the last century, and thank goodness. Where once this was one of the most underserved sectors in all of medicine, we now have a range of diagnosis tools, therapies, and institutions specially designated to help the mentally ill. However, some patients still receive less than adequate mental health care, because the industry is understaffed. This is evidenced by skyrocketing job growth in the field as health care organizations are hiring at a rapid pace to fill the void. If you think this might be the career for you, don’t wait any longer to get started. First, though, it’s smart to learn a little more about the industry as a whole. Let’s talk about psychiatric nurses are and what they do, challenges they face, money and job opportunities, required education and more. Only once you have a well-rounded picture of the industry and your potential place within it, you can make the best decision for your career and future. Psychiatric nurses help treat patients who have been diagnosed with mental conditions ranging from mild to severe. These include commonly known conditions such as schizophrenia, bipolar disorder, anxiety and depression. In addition to having knowledge of pharmaceuticals, which enables you to write prescriptions for patients to help treat chemical imbalances, you will be trained in cognitive and behavioral therapies so you can engage with people on a spoken level to address their fears, behaviors and goals. 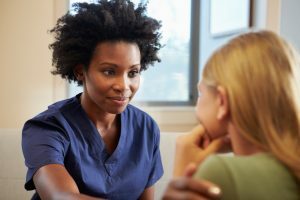 In addition to speaking with patients themselves, psychiatric nurses also speak with and educate spouses, family, and members of the community. They frequently work as part of a medical team with doctors, other nurses and specialists. They may even work with government employees or social workers, helping their patients navigate the challenges of state and federal systems. The main goal of any psychiatric nurse is to help patients live the most productive lives possible. That includes providing interventions, responding to crises, adjusting medications, speaking with patients regularly, diagnosing and evaluating on an ongoing basis, and helping their patients master the skills necessary to be successful members of society. Psychiatric nursing is an advanced practice which enables you to assess, diagnose and treat individuals as well as entire families suffering from mental disorders, and to identify the potential for such disorders using both medication and therapy. Psychiatric nurses may either be primary care providers, working in institutions to oversee patients who have recently undergone a severe mental health or other life crisis, or they may operate as specialists, whom their patients visit on a regular or semi-regular basis for diagnosis, evaluation and adjustments of medication or therapy over time. As a psychiatric nurse, you may help people overcome phobias, modulate the effects of conditions such as bipolar disorder or psychosis, or help them overcome substance abuse. You will have contact with many people, including patients, their families, health organizations, other medical providers, insurance companies and the community as a whole. Advanced Practice Resident Nurse: An APRN has earned a master’s degree or more in nursing. As the title indicates, they are resident nurses who have gone beyond the typical scope of an RN and now specialize in a certain field. These include Certified Nurse Midwives, Certified Registered Nurse Anesthetists, Nurse Practitioners and Clinical Nurse Specialists. For our purposes, only the last two matter, because only they can work as psychiatric nurses. While all psychiatric nurses are APRNs, not all APRNs are psychiatric nurses. Advanced Practice Resident Nurse – Psychiatric Mental Health: This is one type of psychiatric nurse, and one of the most common, which is why you may see the term pop up when learning more about these careers. These nurses are still APRNs, and as such can administer medication and offer a variety of therapies to help their patients improve their lives. Psychiatric Mental Health Nurse: This is the umbrella term that describes nurses working in mental health, and is the same as a “psychiatric nurse.” Don’t be fooled, however: just because the term is different does not mean the requirements are. You will still need to be an APRN to work as a psychiatric nurse. Again, you can enter advanced practice by getting a master’s and becoming a Nurse Practitioner or a Clinical Nurse Specialist. You may see a few other terms as well, including Psychiatric and Mental Health Clinical Nurse Specialist (PMHCNS), Psychiatric Mental Health Nurse Practitioner and Doctor of Nursing Practice (DNP), the latter of which requires a doctoral degree and enables you to practice an even narrower and more specialized niche of medicine. Of course, it is impossible to list every task a psychiatric nurse must perform to be successful in their field, but the above represent a few of the most common. Psychiatric nurses also maintain their credentials through continuing education and continual reading and often contributing to medical journals. Most psychiatric nurses have a Master’s degree, enabling them to work as APRNs. This role also requires they pass board certification for their license, the exact nature of which is dictated by their jurisdiction. Some psychiatric nurses will get a doctorate to practice at an even more advanced level, and will also require a license. Note that in some cases, you may be able to work as a psychiatric nurse assisting doctors of APRNs if you have only a bachelor’s degree. This role is referred to as a Psychiatric Mental Health Registered Nurses (RN-PMHs), who help a variety of populations with mental illness. However, you will not be able to prescribe medication or practice on your own, but will need to work under a physician or an advanced practice nurse. Psychiatric nurses work in a range of settings. These include physician offices, hospitals, outpatient care centers, substance abuse and rehabilitation facilities, universities, offices of other healthcare practitioners, or in private practice. Frequently, they also work in schools and at colleges, especially those that cater exclusively to people with mental health and developmental disabilities. Nursing is a job that makes travel quite easy, and many psychiatric nurses opt to do shorter stints in many places as a way of seeing the world. Not only are a range of jobs available in the United States, but APRNs are welcome in many other countries, as part of international aid teams, or on the staff of nongovernmental organizations or non-profits. Some psychiatric nurses even visit patients in their homes, or travel from facility to facility to see patients and advise the staff there. Nurses may also work for home health care organizations, where they are a part of the team treating patients in their houses and apartments, and others work in prisons or jails. No matter what form your job takes, you will probably work full time. In hospitals, this is 36 hours, or three 12-hour shifts. In your own practice, you may keep regular working hours. Either can be challenging, both because the hours can be long, and because it can become draining to provide care to such a needy, and often unhappy, population. Additionally, you will frequently need to respond to crisis, which can occur at all hours of the day or night, and may require you to stay on the clock for long periods of time while the crisis resolves. Psychiatric nurses are also at risk of injury, since patients may frequently be violent or developmentally delayed, and may not have good control of their bodies or emotions. Back injuries and bruising are not uncommon in this field. That’s not to say it’s all bad, however; most nurses find they can overcome these issues easily due to the satisfaction of the job. Psychiatric nurses all fall under the occupational heading of Advanced Practice Registered Nurses, or APRNs. APRNs, as discussed above, include nurse anesthetists, nurse midwives and nurse practitioners as well as clinical nurse specialists, the latter two of which practice as psychiatric nurses. Right now, the field of advanced practice nursing is growing at a very rapid rate: 31 percent. This is faster than almost all other industries, and largely accounted for by the world’s growing population and aging Baby Boomers, who need more and more care. Not only is the job outlook good, so is the pay: psychiatric nurses make, on average, about $107,000 per year, or about $52 per hour. APRNs can increase their level of education by earning doctoral degrees, and will therefore be able to command even larger salaries. Or, if they work for themselves, they’ll be prepared to treat a narrower specialization and will therefore be in higher demand. Either of these outcomes makes a doctoral degree in nursing a good idea financially, because it opens doors to careers that lesser degrees won’t. Psychiatric nurses either work independently in their own practices, within educational institutions or other organization with their own offices, or alongside physicians in clinics or hospitals. They may provide a range of services, including diagnosing patients, ordering tests, assessing thoughts and behaviors, performing talk therapy and prescribing medications. They may specialize in certain populations. Common specializations include children, women, families or the geriatric community. They may also treat specific conditions, such as schizophrenia, depression or mood disorder, to name a few. The more advanced a nurse’s degree, the more they can specialize. To become a psychiatric nurse, you must first become a registered nurse, which requires two years of schooling. If you are not already an RN, the best path is to enroll in a university full-time and earn your Bachelor’s degree, which you will need before applying for a Master’s program. Often, APRN programs expect you to have on-the-job experience before entering an advanced program, so it is advised that you check with any program you are considering before applying, and craft a plan to gain experience, if that is a requirement for admission. After completing your graduate degree, you will need to undergo clinical training with oversight from practicing APRNs and other medical providers. Then you will need to pass the state licensing exam, and from there, may pursue further specialization if you wish. While it is admittedly a long road toward becoming a practicing psychiatric nurse, most people find it a hugely rewarding job, in which you can both help people and add contribute to a field that has a huge need for skilled professionals. If you choose this path, the likelihood is that you will be very glad you did.